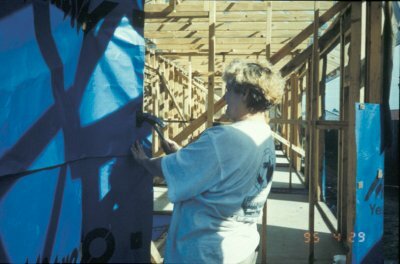 May was a participant in a state housing authority's, group self build program. The group work on each others houses and divide the tasks according to participants different skills. "My house is one of the fourteen we are building on the estate. ...I am the only single woman on this current project, also the oldest (I am fifty years old), most of the couples are in their twenties. I get a lot of support from most of the group members and many of them turn to me for advice and help, I guess I am the mother figure." May said " I am not prepared to pay rent for the rest of my life, I need the security of owning my own home. ...It has always been a dream of mine to own my own home. Well at long last I have the opportunity of obtaining my little piece of security, thanks to the group self build project." She said that home purchase was not an option for her because" it was impossible to save the necessary deposit while raising a family on one's own. ...I have been a single mother, raising four children on my own, without any family. ...I come from the United Kingdom and have no family of my own in Australia, apart from my children. Struggling to make ends meet and keep my four children fed and clothed was a near to impossible task, hence there was never any money to be saved for anything let alone a deposit for our own home." 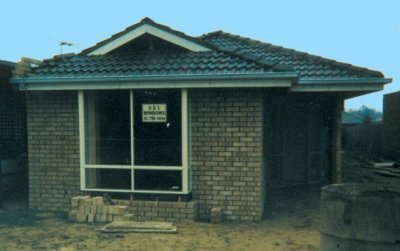 For May self build was an affordable option. Being a self builder has not affected May's income as she has continued in paid employment while building outside office hours. "I have never been afraid of hard work and this surely is hard work, but as tired as I feel, I also have a great sense of satisfaction due to being part of the construction of my very own home. ...Although I have found this exercise to be very tiring , after working at a very demanding full time job that involves long hours, I can stand in my house at the end of the weekend and look around with pride, because I am achieving success in having my long time dream slowly come to fruition." As May's home is still under construction she is unsure what percentage equity in the house she will hold. After trying for four years May was accepted into the group self build project. After a month of preliminaries, construction started in November 1994. May pointed out that there have been some delays because subcontractors have not fulfilled their commitment on time and due to bad weather. "It is taking longer than I thought it would." "We start work at 7:30 am and do any work that does not require making a noise till 9:00 am. We then move on to the various tasks that require power tools. There are various crews for the various tasks involved in building fourteen houses." Making good friends and getting to know the neighbours. The total exhaustion of it all; working full time in a demanding job and working on the house all weekend. It is also very frustrating at times working with chauvinist pig men, we have a few on the group. "I have always been a very independent person, having to strive for myself from a very young age. This project has only enhanced the skills I had learnt along the way. I have also learnt a lot of new skills, which will not only help me in the future to do repairs on my home, but has given me a greater insight into the building industry. This knowledge will greatly enhance my skills in my area of employment, when dealing with employers and the unemployed." "I am looking forward to the end of the project, when I can move into my own dream home and enjoy my surroundings. 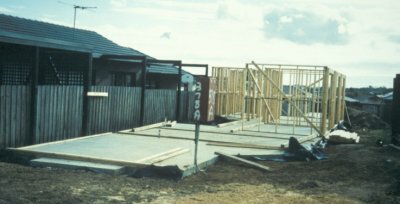 Building one's own home this way has also given me the chance to know my new neighbours and the surrounding neighbourhood, so I will not feel lost when I do move into the area." "I cannot thank the state housing authority enough, for making this scheme available to us single women, it makes a change not to be discriminated against. I am a strong advocate for women getting equal rights and I guess this project has proved, that women are just as capable at achieving as our male counterparts." "When it comes to the needs of women in Australia we still have a long way to go to get equality in many areas. One of the biggest areas that women are unfairly treated is the legal system, being disadvantaged in more ways than one. This is why I found it hard to believe, when I, at long last, managed to get on to the group self build project, that is run by the state housing authority."